The easiest and cheapest way to improve the security of your home is to install a deadbolt. With the right tools, even the average homeowner can get the job done with relative ease. Here's how. Automated security systems are nice to have, but the easiest and least expensive way to improve the security of home is to install a deadbolt lock. Even a high-quality lockset isn’t enough to keep out an experienced burglar; you’re a lot better off with both a lockset and a deadbolt. Since you really do get what you pay for, it’s best not to scrimp here. You’ll save on installation, because it’s so easy to install a deadbolt, you can do the job yourself within a couple hours. Here’s how. Determine the ideal location for the deadbolt. 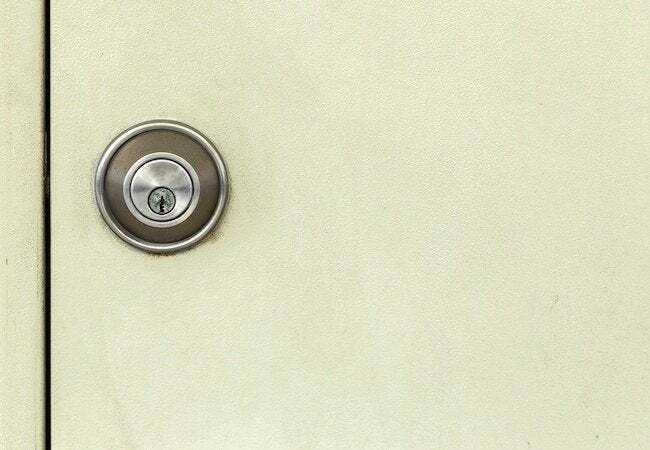 Typically, a deadbolt lock appears 6″ or 12″ inches above the key lock (roughly 44″ from the bottom of the door). With help from your tape measure, pick your spot and mark it on the side of the door (the part through which the bolt is going to extend). Now break out your speed square and pencil a straight line at the mark point; it should extend all the way across the door’s side. Next, again use the speed square, this time to help you continue that line onto the front and back sides of the door. You should end up with a single line that runs continuously, at uniform height, around the door. On each side of the door, mark the point 2-3/8″ or 2-3/4″ from the edge (the measurement depends on the length of your latch bolt; for specifics here, refer to the template provided by the manufacturer of your chosen lock). Meanwhile, on the edge of the door, mark the midpoint. The three marks you’ve made represent where you’re going to drill. First up is the hole for the lock cylinder. Having attached the 2-1/8″ hole saw to your drill, address the mark on the front of door. Rather than drill all the way through, go about an inch deep, then move over and drill through the other side. The result should be a clean, circular hole through which you can easily see the other side. Finish with the 1″ spade bit; drill through the marked point on the side of the door, continuing until this hole meets the other. Choose the faceplate from among the lock parts supplied with your purchase. Match the hole in the faceplate with the hole you drilled on the door’s edge. While holding the plate in position, trace around it with your pencil, marking its silhouette. Having done so, use a 1″ chisel to create a 1/8″-deep mortise within the tracing. The faceplate and bolt are likely attached, so you must install both simultaneously. After confirming which is right side-up for the bolt, slide the bolt through the latch hole, bringing the faceplate flush with the edge of the door (assuming you’ve mortised correctly). Secure the plate with the mounting screws provided before moving onto the key cylinder. When sliding the cylinder into place through the larger hole on the face of the door, be sure to fit the tailpiece of the cylinder through the corresponding holes on the bolt. Once it’s correctly positioned, screw the cylinder onto the door. Then repeat with the other half of the cylinder: Slide it into the door, join it to the bolt, then screw it in. The hard part is over. After locking and unlocking the mechanism a few times to test its functionality, activate the bolt and shut the door as far as it will go. On the doorjamb, mark the point where the bolt hits. Here, using the 1″ spade bit, drill a hole to accept the bolt. Now look over to the unused lock parts you have left; the strike plate should be among the last remaining. Fit it over the hole, then trace around it with your pencil. As you did for the faceplate in step 3, proceed to chisel out a 1/8″-deep mortise. Once finished, set the strike plate into the mortise, making it flush with the jamb, then secure it in place with screws. Test the door to be certain that it’s working properly. Assuming it is, you can now rest easier, knowing the average burglar would have a much, much harder time gaining entry to your most valuable investment—your home.